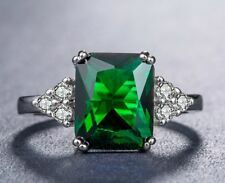 This is an absolutely stunning vintage look Emerald and White Topaz (simulated) Ring. It's a beautiful colour, pictures don't not do it justice. Definitely one to get you noticed. Beautiful ring. Ring size is R 1/2. Please buy correct size as not resizeable. Comes in a beautiful black velvet ring box. Other sizes available. Stunning Emerald and White Topaz Cocktail Silver Plated Ring Size Q. This is an absolutely stunning Emerald and White Topaz (simulated) Cocktail Ring. It's a beautiful colour, pictures don't not do it justice. Definitely one to get you noticed. Beautiful ring. Ring size is Q. Please buy correct size as not resizeable. Comes in a beautiful black velvet ring box. Other sizes available. Will despatch In Organza Pouch. Sorry no box. Stamped 925. Stunning Emerald and White Topaz Cocktail Silver Plated Ring Size Q 1/2. This is an absolutely stunning Emerald and White Topaz (simulated) Cocktail Ring. It's a beautiful colour, pictures don't not do it justice. Definitely one to get you noticed. Beautiful ring. Ring size is Q 1/2. Please buy correct size as not resizeable. Comes in a beautiful black velvet ring box. Other sizes available. Beautiful vintage look Emerald and White Topaz Silver Plated Ring Size N.
This is an absolutely stunning vintage look Emerald and White Topaz (simulated) Ring. It's a beautiful colour, pictures don't not do it justice. Definitely one to get you noticed. Beautiful ring. Ring size is N. Please buy correct size as not resizeable. Comes in a beautiful black velvet ring box. Other sizes available. 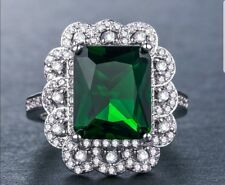 This is an absolutely stunning vintage look Emerald and White Topaz (simulated) Ring. It's a beautiful colour, pictures don't not do it justice. Definitely one to get you noticed. Beautiful ring. Ring size is O 1/2. Please buy correct size as not resizeable. Comes in a beautiful black velvet ring box. Other sizes available. Ring Size 6. Jewelry Type Ring. Color Green. Gorgeous piece! Total weight:3,2 gr.